Bifun rice noodles are pretty amazing because they have a lot of sturdy body to them. They are naturally gluten-free and only contain one ingredient: rice! No fillers. Some gluten-free pasta can fall apart when boiled, or it just doesn't have a very appealing fluffy texture. I love these noodles because they are so fluffy! And they chill very well. They soak in all the flavors of the peanut sauce and more and hold up really well. My noodles were Eden brand. Bifun are thin translucent noodles made of 100% steamed rice. And the best part is that these noodles cook in just 2-3 minutes! Fast food. If you cannot find bifun noodles, look for some sort of a rice or udon noodle. 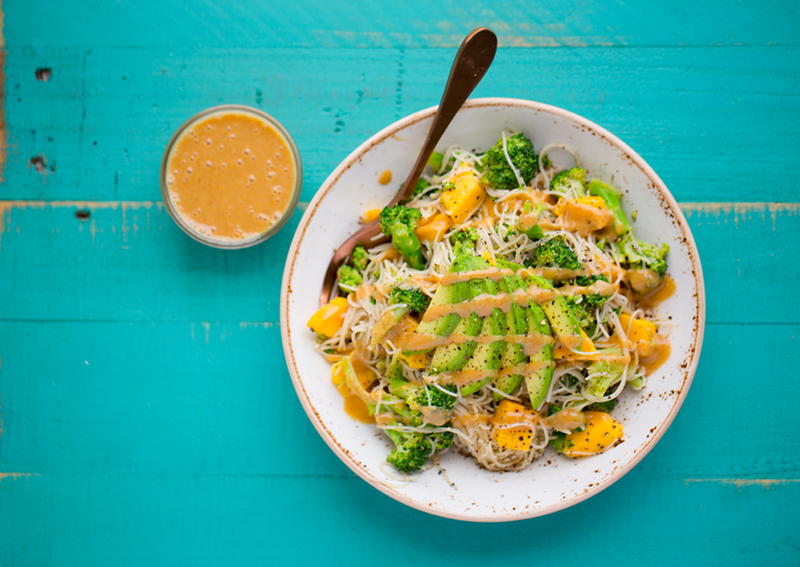 Or a 100% buckwheat noodles would work really well too kind of like this recipe: Peanut Soba Broccoli Tofu Noodle Bowl. This super easy rice noodle bowl is delicious served warm or chilled. 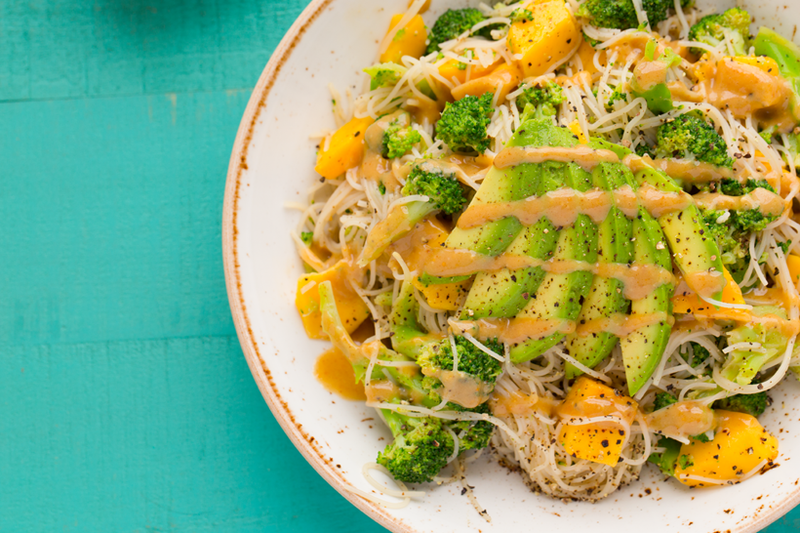 Packed with protein-rich broccoli, sweet mango, avocado and peanut sauce on top, this noodle bowl is perfect for a one bowl meal. Bring a large pot of water to a boil. Add the rice noodles and cook for 2-3 minutes, or until tender. Remove noodles and place in a large mixing bowl. Rice the noodles in cold water. Drain water well. Set aside. 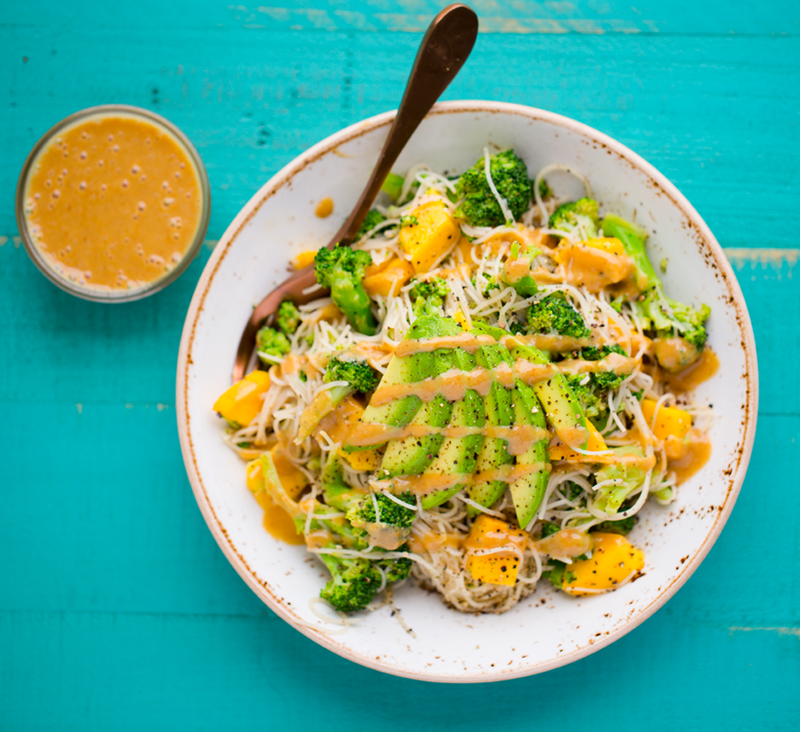 Add all the peanut sauce ingredients to a blender and blend until smooth. Add 1 Tbsp of the sauce to the rice noodles and toss well. Pour the remaining sauce in a small serving dish, cover with plastic wrap and place in the fridge until needed. Bring you pot of water to a boil again. Add in the broccoli florets. Boil until tender. Drain water from the pan and add the liquid aminos to the broccoli, toss well. 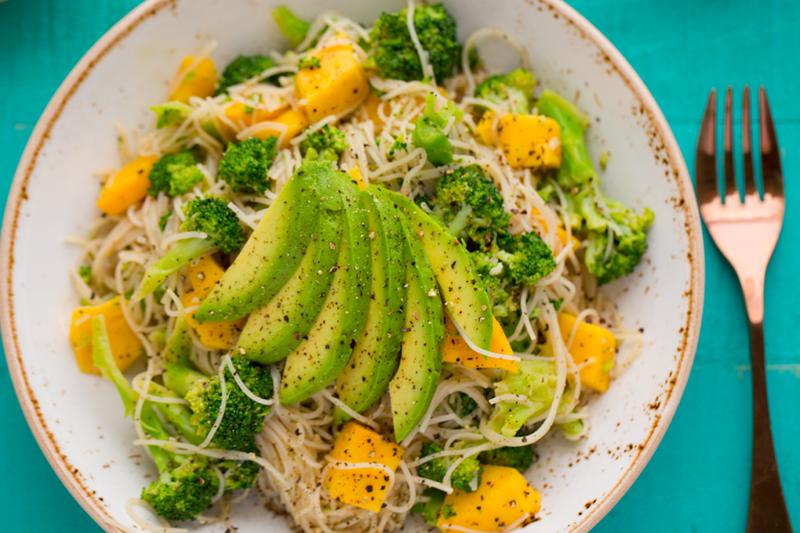 Add the broccoli to the rice noodles and toss. 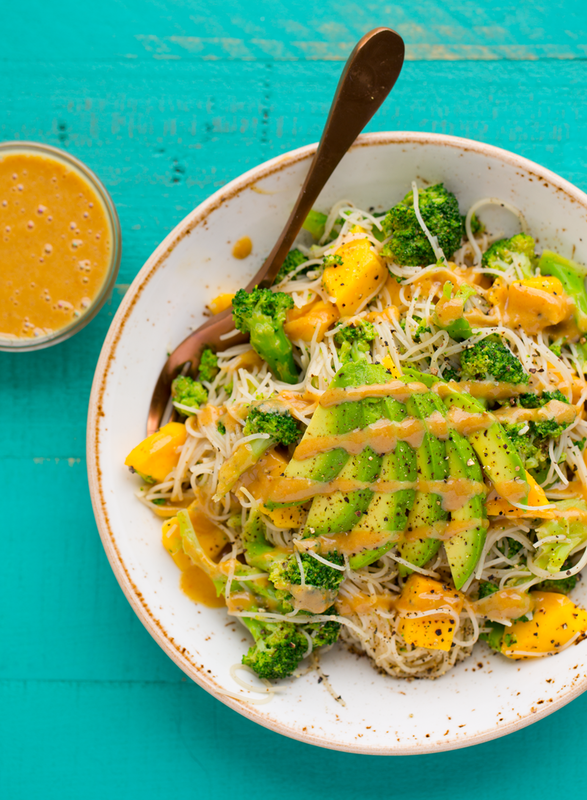 Add the diced mango to the rice noodle bowl and toss again. Pour the noodles into 2-3 serving bowls, depending on how large you want your serving sizes to be. Add the sliced avocado over top. 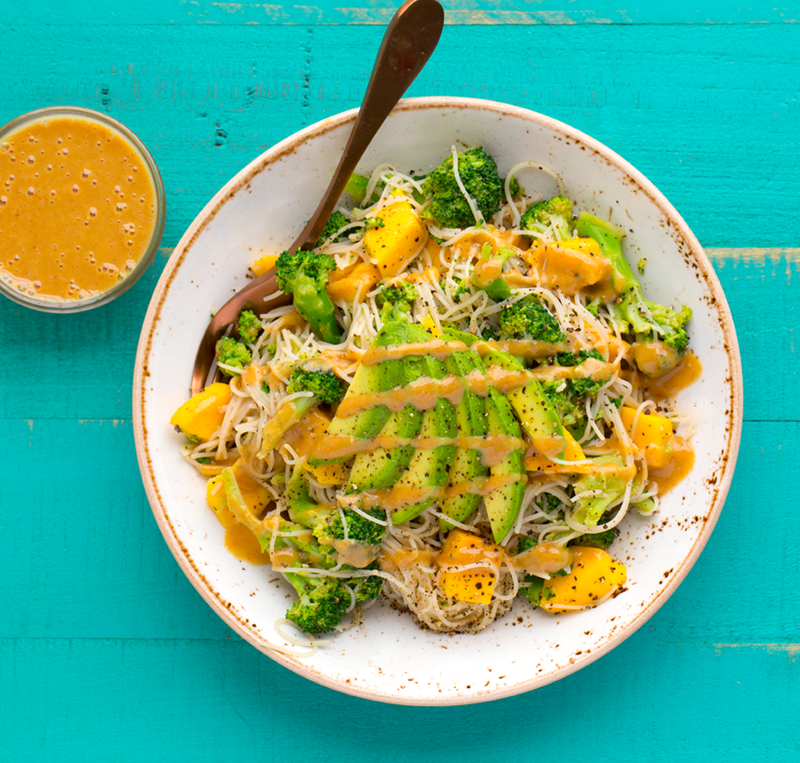 Grind black pepper over top and add an additional drizzle of peanut sauce - to taste. Serve warm-ish right away or cover and chill in the fridge. This noodle dish is delicious served warm or chilled!